Most businesses have a preconceived idea that their app will be extremely popular in the market. Having an app idea and executing your idea successfully is not enough to guarantee that your app will be a success. It is not just about the functionality of the app that you have developed. The definition of success depends on the nature of your app and your business goals. In order to ensure that your app is successful, it is important for you to understand where your competitors went wrong. It is necessary to understand their mistakes and build features into your app to get a better possibility for success. App stores are over saturated with apps that are very similar to each other. This sets new apps that provide similar services as existing ones at a very big disadvantage. In order to avoid this, it is necessary for you as a brand to carry out competitive research, to help you to figure out strength and weaknesses of your app, and to define your own competitive advantage. Building a product with the same features as that of your competitor will seldom help you win consumers. A unique value proposition (UVP) is the preliminary step that you need to consider for overall business success. Often great theoretical ideas simply do not work out when they are put into practice. The decision to launch your project must be research driven. Is there a market for the type of app you are planning to develop? Does your app solve an existing problem? Are you making someone else’s life easy? Are you offering a unique experience? As a brand, it is important that you have a justification for why your consumers will love the app. You need to collect data and facts that prove that your app is better than the app of your competitors. Furthermore, not defining the target audience before starting with the process of mobile app development is another mistake that many brands make. Not defining a target audience will leave you clueless about whom to cater to, and about who would benefit from using your app. So, before you start the process of developing an app, it is required to carry out market research and define a target audience. Many businesses tend to ignore consumer feedback about the app after it is launched. This mistake can land a brand in trouble. A business can only grow when they value consumer opinion and listen to what they say. However, it has been seen that only a few app developers pay attention to this section and thus miss opportunities to meet user demand. It is always recommended to add feedback and comments section to your app. Once, you have this feature, it is very important for you to go through feedback that consumers provide. Some of the comments can be harsh while others can be appreciative. This is the place from where you can gather clues that will help you improve your app. Feedback can be anything like a comment about the services you provide, slow response time or the interface used. The app that you develop must always offer consumers a great user experience. It is an integral part of the mobile app development process. If a user struggles with understanding the basic functionality of your app and cannot figure out the core functionalities easily, this means your app has poor usability. In order to avoid this, it is very important for app developers to follow the best UI/UX practices that are laid out by the platform that they are developing the app on. Ignoring these would be a big mistake, as each platform is unique, and their users are accustomed to using it in a specific way. Therefore, your app has to provide users with a familiar and consistent user experience. Not testing your app properly before launching it, can affect user experience largely and lead to a crash in no time. A single crash is enough to stop users from using your app. It is the fact that most of the negative reviews are for app crashing. The more negative reviews you have, your app is more likely to fall. Make sure to carry out a proper QA before you actually decide to launch your app. App testing must be done thoroughly with a documented process in place, to ensure that your app is market ready. If you fail to impress your users at the first instance, it is difficult to do it the second time over. The success of a mobile app goes way beyond development and design. Not strategizing and planning how to launch your app perfectly, can quickly lead to consumers losing interest in your app. If you wish that, your app should have a high download and retention rate; it is important for you to plan proper pre-launch activities and launch day strategies for your app. Carry out your plan methodically and execute it in a timely manner. The goal is to impress new users quickly before they lose interest. So, plan some exciting activities for the day you launch your app, and keep users engaged by providing new updates and features. 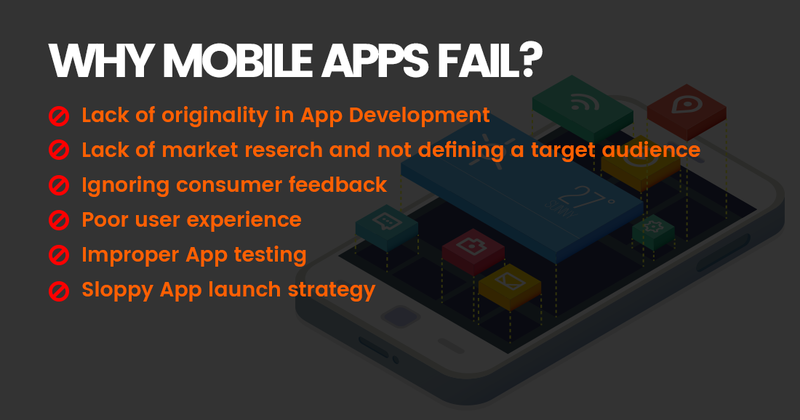 To sum up, a lack of original ideas in app development, lack of market research and ignoring consumer feedback, are the main reasons why many mobile apps fail. In addition, poor user experience, sloppy app launch strategies, and improper app testing are also reasons for app failure. Brands need to carry out proper in-depth research; defining the target audience and figuring out competitive advantages their app has over others, to ensure their app is a success. Revamping the UI/UX features of an app, paying attention to consumer reviews and through testing of the app is highly advisable to improve user engagement and to facilitate higher downloads of your app.